Often times we are extremely rushed in our design projects, the client wanted it yesterday right? As designers we have all learned to deal with deadlines but we should try to work in some additional time for the design process. It will help your designs to be at the high standard you desire. So how can we do this? The most important is to start on each project right away. Don't wait until everything else is caught up, you will behind before you start. Starting does not necessarily mean we have to drop everything, start your research while you are living your life, shopping, eating out, start thinking about the project on your drive home. You can never start to early and simple steps can give you that extra time to process. You need to jot down your ideas early to give them time to process. 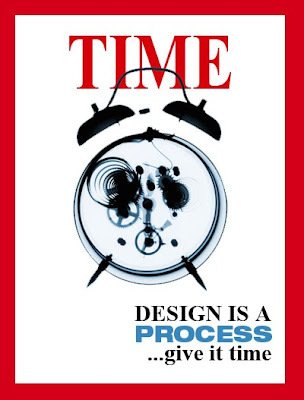 Good design is a process and takes time, so give it some. 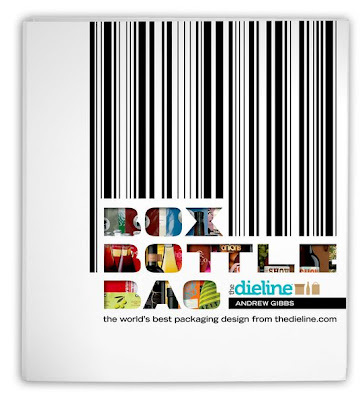 Box Bottle Bag is a new book coming in March from Andrew Gibbs, the founder of the TheDieLine.com. The books is a collection of the best from the blog. It will be in hardcover with a matte varnish and a diecut cover. Andrew was one of my "star" package design students in the class I teach at the Art Institute of California - Orange County. Andrew started TheDieLine.com several years ago, I still remember how excited he was to get it going, and it has become the leading go to site for package design. Congratulations to Andrew on his forthcoming book and all the great work his blog has been presenting. To pre-order a copy go to this link at amazon. 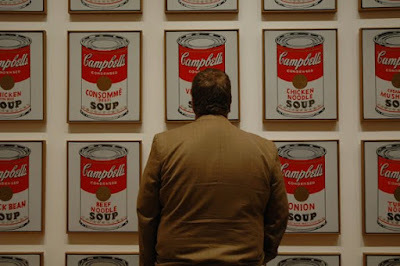 Being inspired by visiting art museums is always helpful in our creative process. Good, you got to the museum, now observe. Do not just take a quick look at the work, get in there, and look at it. 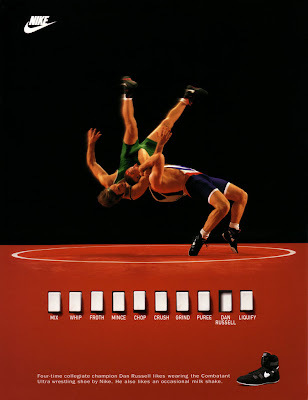 Get up so close you make the guards nervous. Study the work and bring the ideas back into your own work. This is the start a series on tips and ideas to get and keep creative as a designer. If you have any tips you would like to past along, please email me and I will be happy to post them. 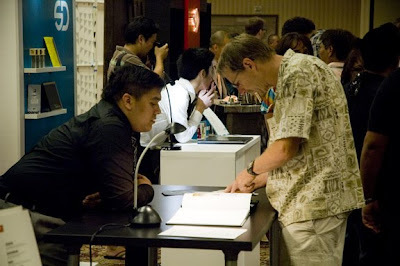 Another quarter has ended at the Art Institute of California - Orange County with the Summer 2009 Portfolio Show yesterday. It has been my pleasure to help these graphic and advertising majors complete this first stage so they can start what I hope is a long and happy career. 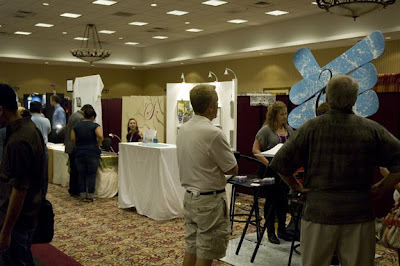 The portfolios where polished and their displays looked great. I wish the graduates all the best with their designs and careers in the future. Congratulations and the best of luck! Andrew Christou - no Range Rover for this ad man, he drives Prius. 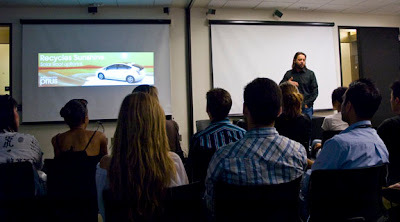 Andrew Christou, the Creative Director behind the most recent Prius campaign from Saatchi and Saatchi, LA visited the Art Institute of California - Orange County last month to speak to a group of advertising and graphic design students. Andrew's memorable ad campaign for the next generation Prius has taken the line to a new level. He spoke about the process of the campaign and the many channels used to sell the Prius, not just the striking TV ads, like online, interactive, and non traditional means like POPs on the streets. 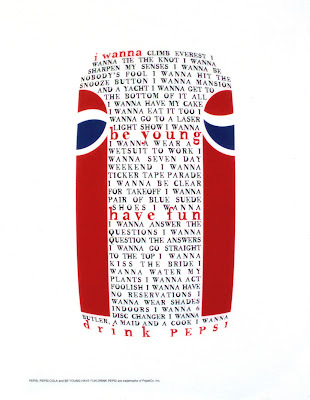 Andrew has worked on ads for many of the "biggies" including Toyota, Nike, Pepsi, Coca-Cola, General Motors, ESPN, and Bacardi. 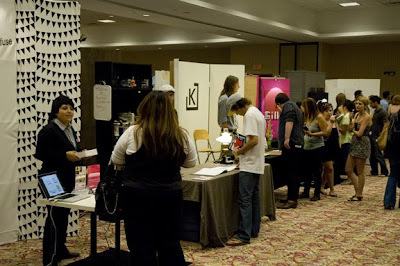 Andrew spoke about the passion and drive of working in the advertising and design field. He gave the students insight to getting started from his early days at SVA, to his first job in New York City to his move to Wieden & Kennedy, Portland where he did the Lil Penny ads for Nike. 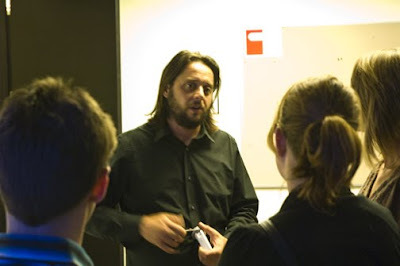 Passing along his thoughts on working hard, being creative, and sticking to your concepts and ideas, in a relaxed and humorous manner, Andrew spoke from the heart. 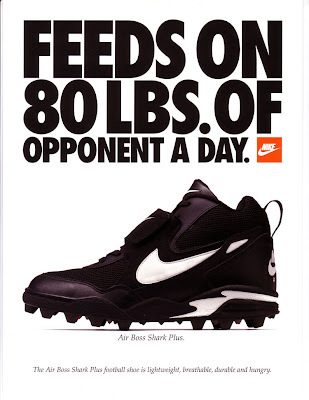 Andrew discussed the sometimes mad pace of the advertising world in reference to a series of Nike ads related to a past baseball strike where concepts, filming and production where all done in a week. Andrew's discussion was insightful and it was a pleasure to meet this down to earth Creative Director. 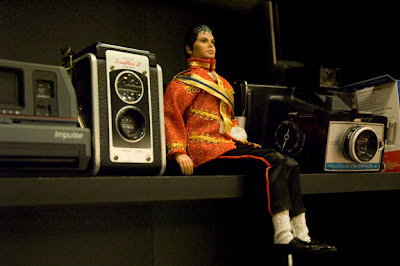 I thank Andrew for giving of his time to pass along to the next generation of creatives. To view more of Andrew's work please check out his website where you can view many additional ads that he has created over the years. YES! The season has finally really started today. (That one game on Thursday did not really count for me) The air even had a brisk feel today. Sunday's just got a whole lot better. 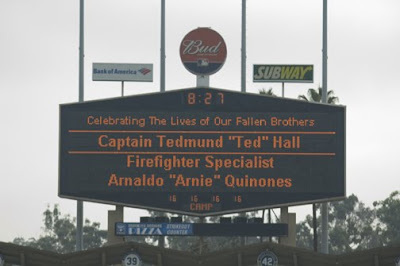 Yesterday I had the honor to attend a moving ceremony hosted by the Los Angeles County Fire Department at Dodger's Stadium for Captain Ted Hall and Firefighter Specialist Arnie Quinones. Capt. 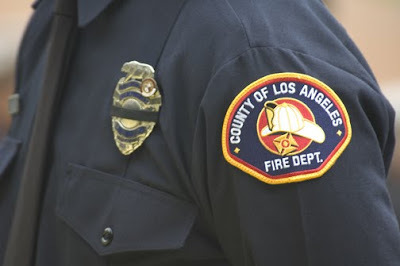 Hall and Firefighter Specialist Quinones where killed during the fire fight at the Station Fire, a wildfire in the nearby Angeles National Forest on August 30th. Both Hall and Quinones where from Camp 16 and where trying to find a safe route off the mountain for their crews when their truck tragically fell off a cliff killing them both. 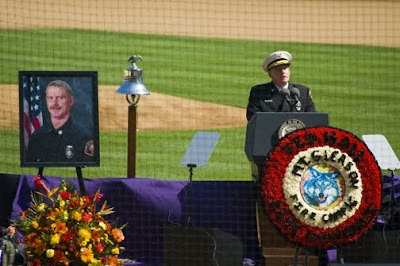 They both where remembered as true firefighters who loved the job and died protecting their crews. 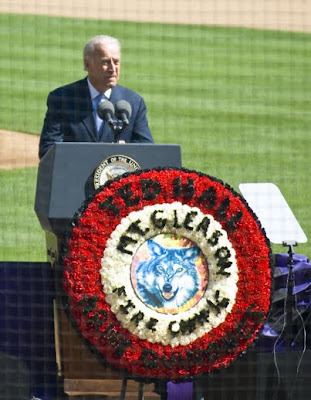 The memorial was attended by Vice President Biden and Gov. 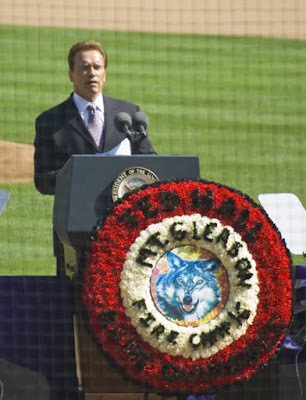 Schwarzenegger along with many other officials, families, and firefighters from around the country. 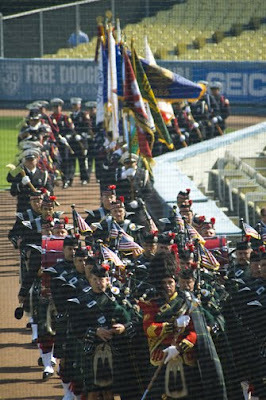 The memorial included traditional firefighter honors of taps, bagpipers, and a ringing of the last alarm of 5-5-5. 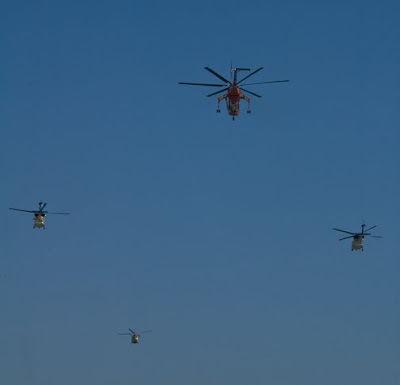 The service concluded with a flyover from helicopters in a missing man formation. 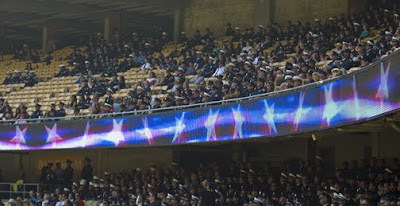 The memorial was a wonderful tribute to these brave men who are a loss to the fire service and who will not be forgotten. Core77 has an excellent area of their site called Hack2Work. 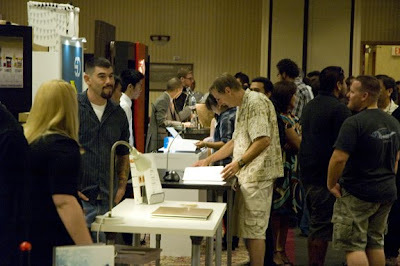 It is filled with interesting tips and thoughts on the world that we work in, DESIGN. Articles include How to Make Your Client's Logo Bigger Without Making Their Logo Bigger by Michael Bierut, Dos and Don'ts for Designers Dealing with Business by Helen Walters, Consider Freelancing or Coworking, Why Does the Firm Own Everything I Do? Intellectual Property & You by Katy Frankel plus many many more. You have to explore and see all the articles at Hack2Work. 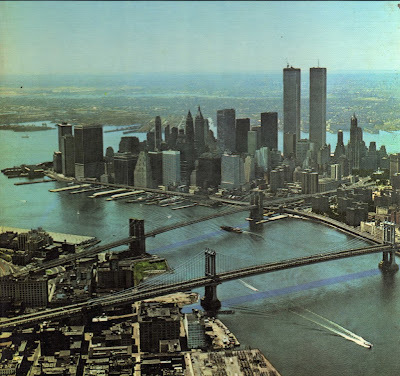 Let us not forget those that perished this day in 2001 in NYC, Washington DC, and Pennsylvania. 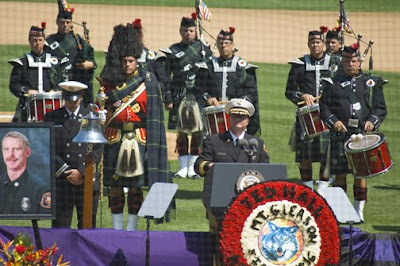 View a tribute to fellow firefighters that where lost on September 11, 2001 from the FDNY. You are not forgotten my brothers. Happy 09-09-09. 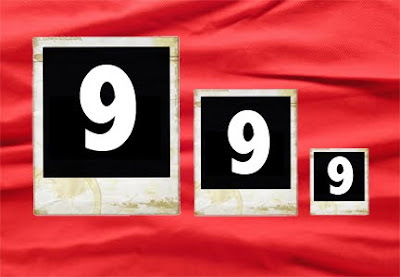 I hope your 09-09-09 was a good one. It was kinda of an unofficial holiday of sorts. One question, where we to dress to the nines today? 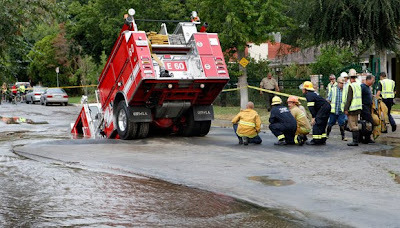 Ever feel like you are having one of those days? 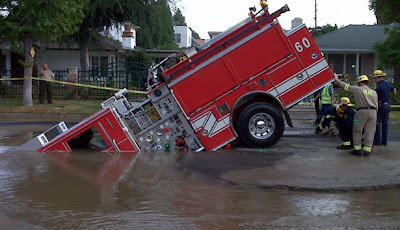 Engine 60 from Los Angeles City Fire (LAFD) had one of those days investigating a water leak this morning. Read more at the LA Times. 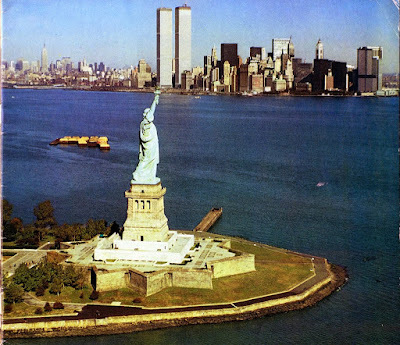 The first Labor Day in the United States was celebrated on September 5, 1882 in New York City. In the aftermath of the deaths of a number of workers at the hands of the US military and US Marshals during the 1894 Pullman Strike, President Grover Cleveland put reconciliation with Labor as a top political priority. Fearing further conflict, legislation making Labor Day a national holiday was rushed through Congress unanimously and signed into law a mere six days after the end of the strike. 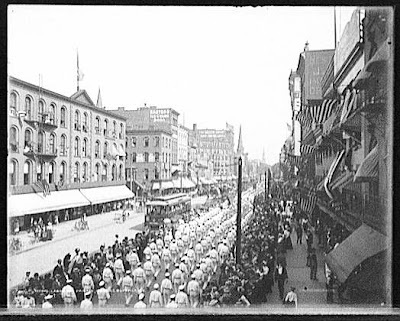 Some 10,000 workers assembled in New York City to participate in America's first Labor Day parade. 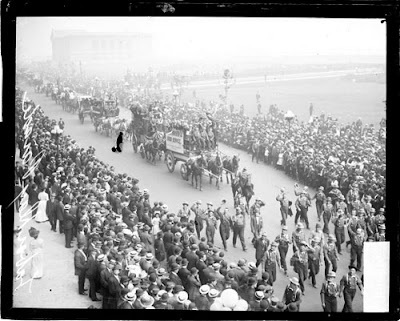 After marching from City Hall, past reviewing stands in Union Square, and then uptown to 42nd Street, the workers and their families gathered in Wendel's Elm Park for a picnic, concert, and speeches. 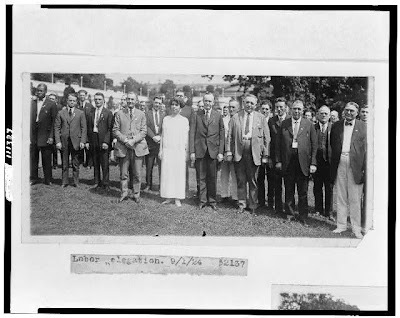 This first Labor Day celebration was eagerly organized and executed by New York’s Central Labor Union, an umbrella group made up of representatives from many local unions. Debate continues to this day as to who originated the idea of a workers' holiday, but it definitely emerged from the ranks of organized labor at a time when they wanted to demonstrate the strength of their burgeoning movement and inspire improvements in their working conditions. The theory is that design can help to bring about a change. Seem right to me. 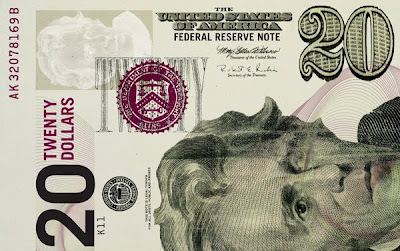 To put the theory to a test, Richard Smith, a designer in New York, decided with the economy in the tanks, it was time to redesign the US $1 bill. The idea was started and has taken off in the form of the Dollar ReDe$ign Project. Many designs are wonderful and serious but humor pops up at times in several of designs. If you have your own designs, send it along to the site, as more are welcome. See more and learn more about this project to give us all a new look, new pride, and new hope through the redesign of the dollar bill. A short video interview with Richard Smith about this project can be viewed below. The Dollar ReDe$ign Project can be viewed at this link. 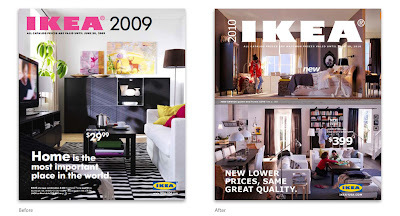 For the last 50 years, IKEA has used Futura as its typeface for everything from its catalog to signage. Now change has come to the use of Futura. 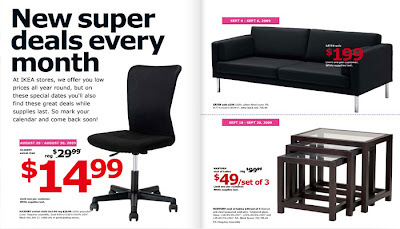 IKEA has decided to switch typefaces to Verdana. I feel that Futura does give a touch more modern feel that has been the basis to the IKEA brand. The official explanation states it will allow them to use the same typeface in all the world markets they reach in both print and web use. Any thoughts on the change? See and read more at idsgn. I got back yesterday from several days working on the Station Fire at the Angeles National Forest just outside of Los Angeles. I was serving as a captain on one of the hundreds of engines that are trying to put a stop to the fire that has grown to over 219 square miles (140,000 acres) in size. 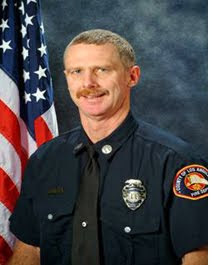 Tragically, two firefighter have been killed in the line of duty trying to control this huge blaze. 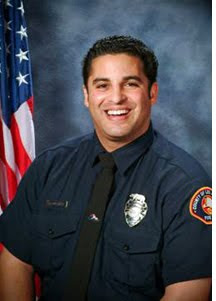 On Sunday, August 30th, Fire Captain Tedmund "Ted" Hall and Firefighter Specialist Arnaldo "Arnie" Quinones, both from the Los Angeles County Fire Department, where killed when their emergency response vehicle went over the side and fell 800 feet into a steep canyon during fire suppression activities protecting Camp 16 in the City of Palmdale. 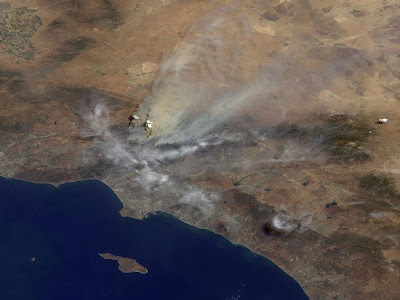 The fire is at 22% containment so a lot of work is still to be done. So far 92 structures have been destroyed of which 62 where residential homes. 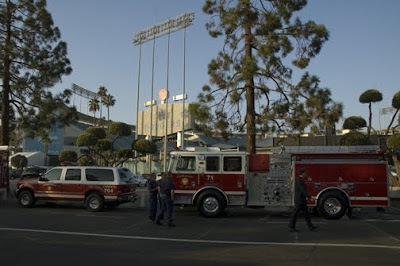 Let us all hope for a quick end to the Station Fire and no further injuries or deaths. 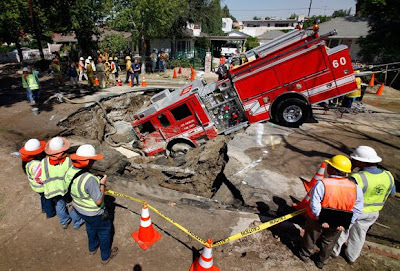 To my fellow firefighters, be safe out there.